Note: This article is the first of a 2-part series on the call to unconditional love in marriages. MAIN POINT: Self-love is deceptive. Before true love can increase, self-love must decrease. One of the most popular topics I have dealt with in my years of ministry is marriage. Now as I look back, romance is never really a major part of my parents’ marriage. In some way, I can see how my parents’ marriage is transformed from romance to commitment; from fantasy to reality; from childishness to maturity. Marriage is a TIP: Transformation in Progress. It begins with a transformation of self. It requires one to look beyond self-importance. It needs one to move away from self-love. I think society at large has overstated the importance of love. Not that I disagree with the idea of love. I think people have defined ‘love’ based on their own terms more than anything else. Self-love appears to be the trend in many marriages, masqueraded as needs. Self-love remains a primary motivator. You get the point. If you want to sell books, talk about self-love. If you want attention, talk about loving the self more than others. Unfortunately, marriage is not a proverbial ‘nail’ for any self-help ‘hammer’ to work on. It is a plant that needs cultivating. Our chief problem in marriage is our tendency to see marriages with goggles of self-love. Staying in marriage becomes a conditional ‘Only-If.’ Only if the husband treat her well. Only if the wife behaves in a certain way. A 50/50 marriage looks more like a contract fulfilled only 50% at best. It is not Christian at all. Self-love is 50/50. True love is 100/100 regardless. KEY POINT: Self-Love restricts oneself toward a contract (50-50) rather than a covenant (100% regardless). A marriage is not a path toward self-fulfillment. It is about planting a seed of love together. It is about watering this plant gently with care. It is about giving it enough sunlight. Not too much that the young seedling gets scorched. Not too little that the plant becomes wrinkled. Just enough for it to grow well. This cycle of care will result in a tree that brings forth fruits in its season. A self-seeking person is not patient to wait for the seed to germinate. No pause for admiration. No time for perspiration. The self-seeker will rush the growth. If the growth is not there, he/she will find all kinds of formulae to try to spear its growth artificially, not naturally. The self-seeker will add in additional supplements, or growth accelerators. If possible, this self-seeker will even attempt a transplant. The self-seeker seeks to control growth. Anything that frustrates this control tempts this person toward the D-word. He/She demands results. He/she demands fruit even though it is out of season. Like a tree that refuses to shed its leaves during Winter, the self-seeker dehydrates the tree and freezes the relationship. KEY POINT: Self-Seeking kills relationships. Two gardeners began planting shrubs in early January. The rain, snow and frosty conditions have practically laid bare the garden for planting. The first gardener tried to do things in a rush. He used chemical de-icers to melt any frost and icy grounds quickly. Concerned only about his dream plant, he did not bother with the rest of the plants in the garden. Seeing a cup-like bird feeder on the fence as an eye-sore, he removed it and threw it away, sensing that there is no use for it anyway. The second gardener also planted the same shrub in almost identical conditions. Instead of using chemical de-icers, he used compost to work the ground. Though it took a little more time, the ground became more enriched by the organic mixture. He cleaned away the foliage in the surrounding plants, believing that the neighbouring plants do affect the growth of his shrub. He added bird seeds to the bird-feeder, hoping to encourage birds to visit his garden. Spring arrived. Both shrubs germinate and grew. The first gardener saw results only for that year. The second gardener saw results year after year, after year. Why? In rushing the de-icing, the first gardener’s use of chemical de-icers damaged the ground. The higher salt content from the chemicals may have sped up the de-icing, but it made the soil more toxic for plants. He left the surrounding plants untouched, even the eggs laid by bugs and insects. No bird feeders meant there were no birds to reduce the insect population. On the other hand, the second gardener, saw a bigger picture. He cared for the soil. He cared for the surrounding plants. He cared for the birds. 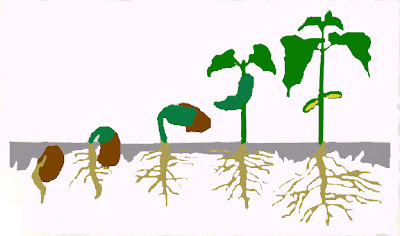 In turn, the soil helped the plants. Insects are fewer, thanks to the clearing of eggs from the surrounding foliage. Birds came that Spring to help reduce the insect population. The entire ecosystem becomes a pleasant experience that enriches the visitor. KEY POINT: A caring heart learns to see the big picture, and will care beyond oneself. The Self-Seeker only sees one small rabbit's hole. Marriage is like planting a seed. We cannot rush it. We need to care for it selflessly. We need to see the big picture, instead of a tiny world of self-love. We should never depend on quick-fix solutions like chemical de-icers. Even if our spouses do not bother with bird-feeders, does not mean we do the same. Let our patient gardening be a demonstration that it is possible to grow our marriages, beginning with us. Let our love for the LORD lead to to practice love unconditional. There is a biblical pattern of being an example so as to win the spouse over. In God’s time. Though written for the wife unequally yoked with a non-believer, the principle of being a blessing to the family is still applicable. This willingness to be a blessing is NOT contingent to the spouse playing his part. Cultivating a marriage needs time. It needs patience. It needs more God-seeking rather than self-seeking. In God, we can become the person we are meant to be. Banish self-seeking. Banish self-love. Cultivate charity to God and to others, especially your spouse. Unconditionally. Thought: It is always easier to change oneself than to change your spouse. If you take care of your own flaws, you will not have enough time to be too critical about your spouse's shortcomings.